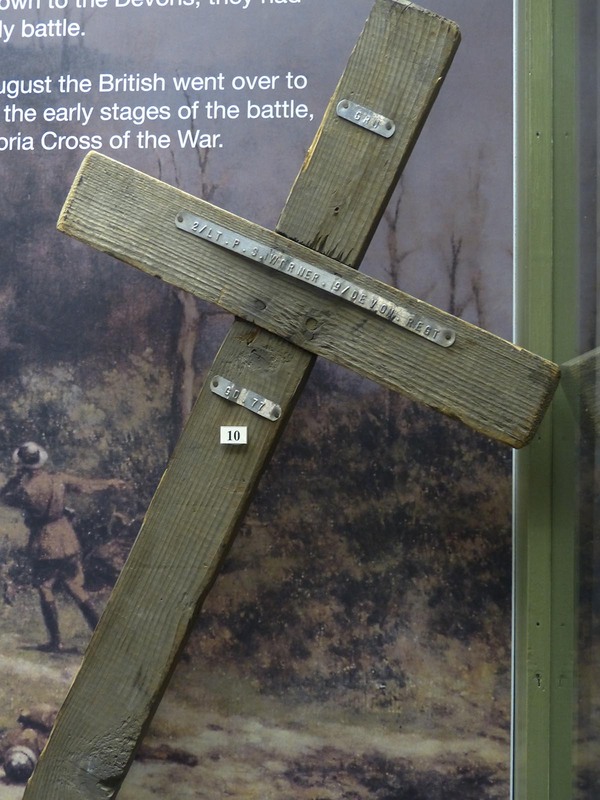 Cross dimensions: Unable to take measurements as on display in a glass case. It is plain, unfinished softwood and is in good condition. 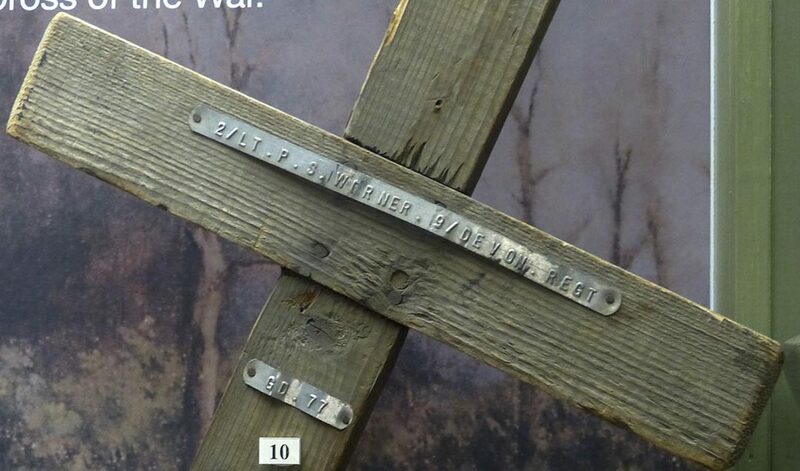 The bottom end of the cross is tapered. 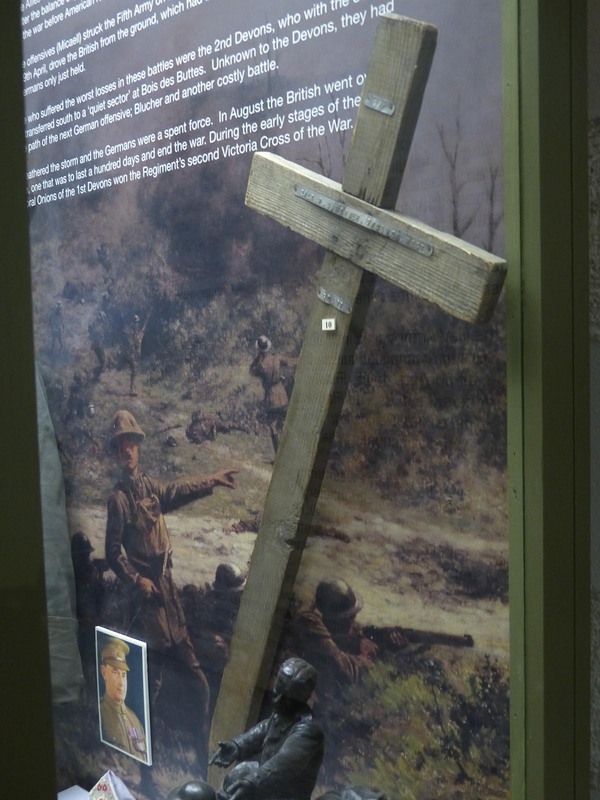 The cross was for 2nd Lieutenant, Percival Seymour Worner of the 9th Devonshire Regiment who was killed in action on the 4th September 1916 while near Ginchy. The battalion sustained over 730 casualties over 3 days early days of September 1916 due to heavy shelling during an attack. 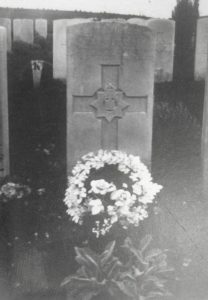 Percy is buried in Bernafay Wood British Cemetery Montauban. He was 32 years of age when he died. Percy joined the 21st Battalion Royal Fusiliers (4th Public Schools) as a Private and went to France on 14th November 1915. The battalion was disbanded on 24th April 1916 with many of the men commissioned as officers with Percival receiving his commission on 6th July 1916 joining the 9th (Service) Battalion Devonshire Regiment. Before the War, Percy was a teacher at St Sidwell’s School in Exeter. He was an amateur footballer and was one of the original founders of St Sidwell’s United who changed their name to Exeter City in 1904. On Remembrance Day 2014 the club unveiled a Memorial at their ground, St James Park, remembering all their players who lost their lives during the Great War including Percy. 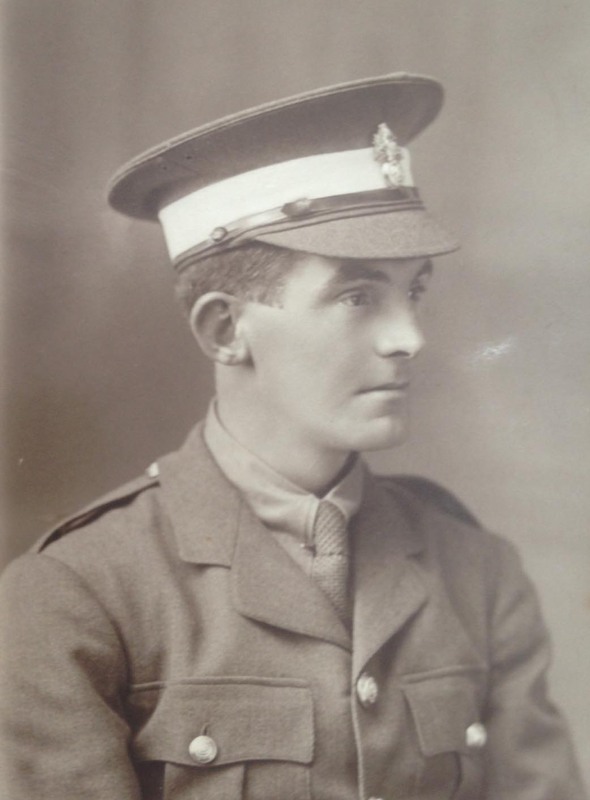 The last letter sent home by 2nd Lieutenant Percy Worner, the Exeter schoolmaster and athlete, who was killed in France a week ago, was addressed to his parents, and now makes the more impressive and stirring reading. It is splendidly English. “I have been appointed to a Company”, he wrote, “whose officers are practically all Exonians… They gave me a great welcome, and have done everything they can to make me at home and comfortable… The men out here are so grand that, whatever my fate may be, I shall be ready for it. The only thing one fears when one finds he is to lead such fine men is that one may funk at the last moment. What is most striking of all out here is the utter cheerfulness and confidence of the men, many of whom have been in France since the beginning. To be among them is the finest thing imaginable. Their cheerfulness and confidence are most infectious. They have been out for a short rest since their last strafe, and yet they are keenly looking forward to another ‘go’. If only the Kaiser could see and understand the spirit of these men he would realise that the game was up so far as he was concerned. Nothing on this earth can defeat their spirit, and I feel it an honour to be privileged to serve with them. No letter could more strikingly reveal the spirit of the former St Luke’s College student than this. News of exactly how he was killed has not reached his parents yet, but that he died a gallant death none who knew him can doubt. News was received from the War Office on Saturday by his parents, residing at 9, Edgerton Park Road, Exeter, that Second-Lieutenant Percy Worner was killed in action in France on Tuesday. He was an only son, and the report of his death will be received with deep regret by a wide circle of his friends in Exeter. When War broke out he was an assistant teacher at St. Sidwell’s School, where he had been a pupil and then a pupil teacher. He underwent a course of training at St. Luke’s College, and there became a very clever association footballer. His college chum and inseparable companion was the international footballer Lieut. Evelyn Lintott, who was killed in France in July. Worner first joined the Public School’s Corps. And was at the Front over six months as a member of it, taking part in several big actions. Then he was sent home to train for a commission, and was recently given a second-lieutenancy. He was in Exeter on leave before going the France last month and was quite enthusiastic about his new duties. He took up military life, in fact, very seriously, just as he did anything to which he put his hand. It was his quite earnestness on the sports field which made him such a warm favourite with everyone, while it is safe to say that at St Sidwell’s School he was held in quite affection and esteem by all his pupils. Only this week a football was sent out to him from the Mayoress of Exeter Depot. He had written there asking if he could have one for his Company, amongst whom he was hopeful of forming a soccer team. His letter was full of cheery optimism. Sec-Lieut. Percy Worner, the former St Luke’s College student, and, before the war, a member of the scholastic profession in Exeter, is now attached to one of the Devon battalions fighting in France and a letter has just been received from him at eh Depot asking for a football for his company. Lieut. Worner was himself a well-known Devon footballer, and in his letter he speaks of the part his battalion have played in the recent fighting. Proceeding, he says, “With the approach of winter, we are very anxious to start a football team in our Company. Could we ask the people of Exeter to help us. We should be extremely grateful?” There was no football left in the Depot stock, but the Mayoress has purchased a new one out of funds, and it has been sent out to Lieut. Worner’s company. Special thanks to Percy’s Great Nephew Colin Williams for the photo of Percy in 1914 and a family photo of his grave. Hi Colin, that would be fantastic. Yes please. If you could email us on info@thereturned.co.uk.